This summer, Red Bull Flying Bach lands in Chicago, making its U.S. debut in an exclusive Chicago engagement after three seasons of sold-out performances around the world. Featuring Berlin-based dance crew The Flying Steps, four-time break dance world champions, Red Bull Flying Bach combines contemporary hip-hop power moves with live classical music. 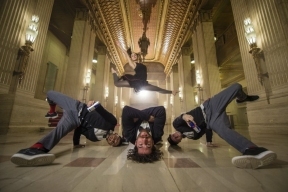 Red Bull Flying Bach runs for six performances only at the historic Civic Opera House, 20 N. Wacker Drive, June 20 – 29. The show itself, 70 minutes in length, features the seven break dancers of The Flying Steps along with contemporary Swedish dancer Anna Holmström in a lively series of vignettes, each showing off the multi-talented dancers’ strengths, including a dazzling array of breaking, popping and locking, flares, head spins, hand spins, footwork, acrobatics and unison work. For ticket information, visit Ticketmaster.com or visit the Civic Opera House box office. To learn more about The Flying Steps, visit www.redbullflyingbach.com.